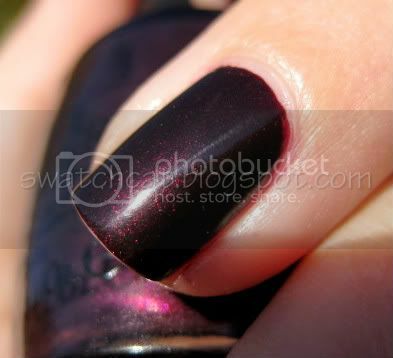 OPI Black Cherry Chutney...sounds Thanksgiving-y doesn't it? It's nothing I'd try because I find cherries yucky, but I'm sure Black Cherry Chutney would be delicious. Being that I don't have to come in contact with actual cherries to wear the polish, I have no trouble sporting OPI Black Cherry Chutney. It is a gorgeous burgundy with subtle red shimmer. Very vampy and perfect to wear for Thanksgiving Dinner. I don't know if Black Cherry Chutney is still available in-store, but I purchased my bottle online a short while ago, so it is available. OPI retails for $8.50. love the reddish-purple shimmer in this one. Any troubles with taking it off the nails? I don't think it was any more difficult than other dark polishes. I think I used four polish-remover-soaked cotton balls for my nails, and a fifth for cleanup. No staining that I can recall.